Kakteen Orch. Rundschau 1978: 95. 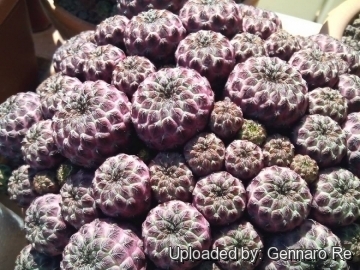 Weingartia rauschii (Sulcorebutia rauschii) Photo by: Andrea B. 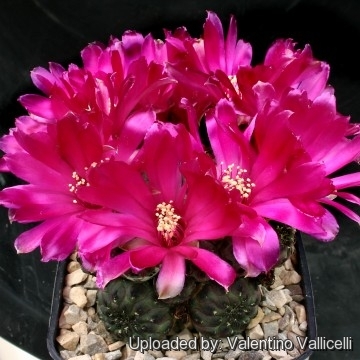 Field number: HS121-1 Collector: Heinz Swoboda Locality: Cerro Flor de Aikampa, Zudañez, Chuquisaca, Bolivia 2700m. The magnificent dark purple blooms. 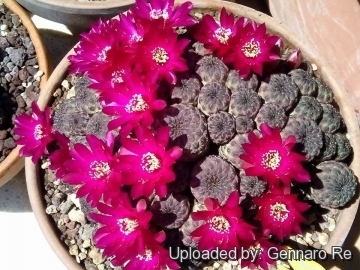 Description: Rebutia canigueralii subs. 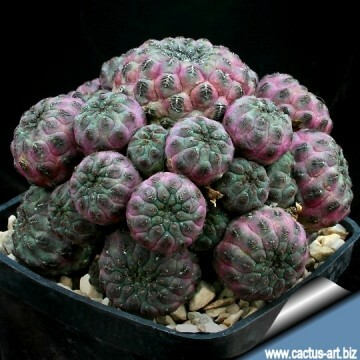 rauschii, better known as Sulcorebutia rauschii, is a local or morphological form of the variable Rebutia canigueralii . It is a miniature clustering species (rarely solitary), readily forms clumps of many purple heads with characteristic very short, black spines form of a fishbone. Stem: Individual stems 2(4) cm tall, 3(5) cm in diameter. The stem is covered by flat tubercles (5 mm wide) which vary in colour between dark green and violet. In older plants tubercles are arranged in up to 16 spiral line merging in the apex. Areoles: Long narrow with short white felt. Spines: 9-11 short black radial spines, 1 to 2 mm long, pointing diagonally and downward, completely flattened against the tubercles, they take the characteristic form of a fishbone. Flower: 20-50 mm long, 35-50 mm wide; floral tube funnel-shaped yellowish green with tan coloured scales, tepals deep magenta with a clearer throat. 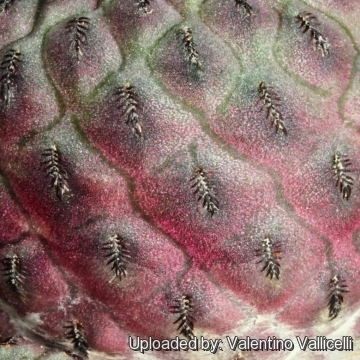 Fruit: Reddish brown, 4-5 mm wide. 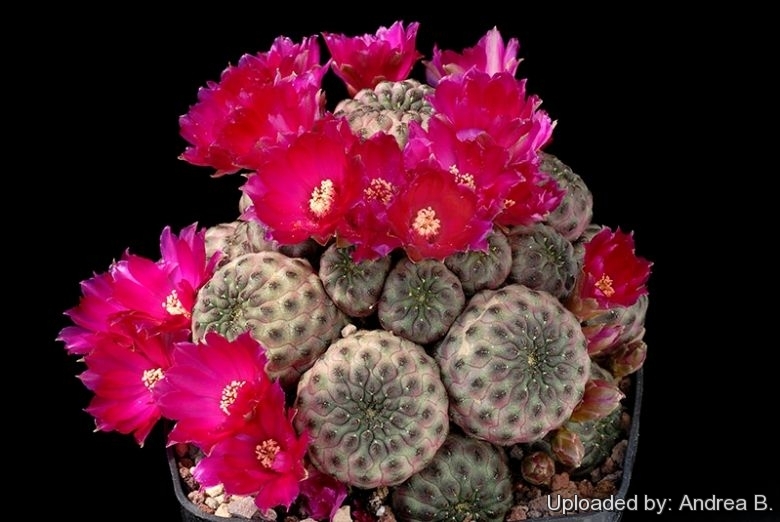 Cultivation and Propagation: Rebutia rauschii is a mountainous plants with a thick taproots and is susceptible to overwatering, it grows rather slowly and need a very good drainage to avoid rotting. It requires also an appropriate air circulation and is sometime grafted to avoid root problems. Soil: It loves a very permeable, coarse mineral soil. Repotting: It require a deep pot suited to accommodate the swollen root, repotting with fresh potting-mix should be done every other year or when the plant has outgrown its pot. However, repotting doesn't necessarily mean they'll need larger containers. 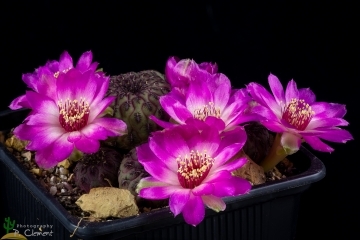 To prevent rottenness it is also advisable to surround its root neck by very rough sand or grit, this help a fast water drainage. Hardiness: Plants are and quite frost hardy -5 (-15)° C but preferably overwinter in a cool place (at 0/10°C). They need to be kept in a cool place during winter rest. This is important for the flowers, as well as for their health. Without this cool winter period, they normally won't get many buds. Watering: It requires moderately watering through the growing season. This can be done weekly or more frequently during the summertime, if the weather is sunny enough, but allow to dry fully before watering again. Kept this way, plants will show a healthy growth. Keep rather dry as soon as the temperature starts dropping in October and keep it strictly dry throughout the winter quiescent period since ot is very sensitive to any moisture excesses. The plants may survives outside without protection in winter (cold hardy to -5° ) but is then somewhat prone to rot, too. 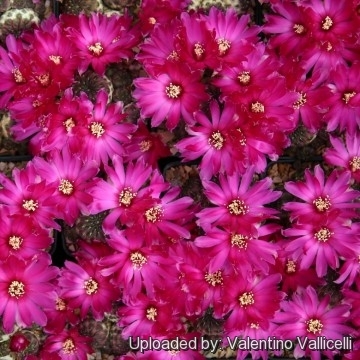 Garden uses: It is a fine plant for a rock garden or container, contrasts well with agaves, yuccas, and low-growing flowering plants. Nice planted with Agave utahensis, another very hardy species. Propagation: Propagation: Seed, cutting, grafting. Take cuttings spring or summer, let them dry till the ends callous well. 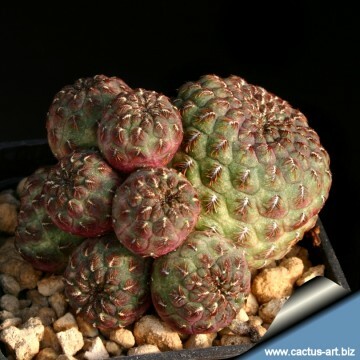 Then replant them in fresh cactus soil that is ever so slightly moist, and keep it that way till they root. Surface sowing is the best; seeds germinate in 14-28 days at 20° C, remembering that seedlings dislike strong light and dry conditions.